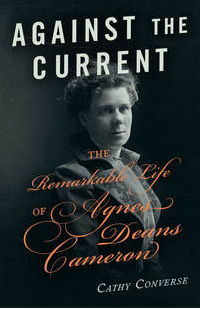 Agnes Deans Cameron (1863 – 1912) was an author, journalist, educator, school trustee, sportswoman, orator, adventurer, and international celebrity. She was the first female high school teacher and first school principal in British Columbia, and during her life became one of Canada's most well-known writers, publishing in the top international magazines and newspapers. She was also a trailblazer in sports, earning the distinction as the first “Lady Centurion” in western Canada. In 1908, Agnes Deans Cameron travelled 10,000 miles down the Mackenzie River and out into the Beaufort Sea—something no other European woman had done—in one short season. Her resulting book, The New North, catapulted her onto the oratory stages of Canada, the United States, and England. Cameron stands as one of the top 150 most significant individuals in the history of the province of British Columbia. Explore the West Coast with Cathy Converse as she cruises to the same beautiful islands and inlets that Capi Blanchet travelled to more than a half-century ago, standing at the helm of a small boat named Caprice. Blanchet embarked on this adventure with her children, visiting Indigenous villages, watching grizzly bears in Knight Inlet and experiencing people and places up and down the coast. While this story is well known, Capi herself remained an enigma. In Following the Curve of Time, Converse introduces readers to previously unrevealed sides of the notoriously private woman who lived an amazing and daring life. Vibrant into her late eighties, Auntie Vie's story starts on the farm and leads to the red carpet; an amazing tale of how one woman's sincere charisma has made her a star. Brought into the spotlight by her great-niece, Pamela Anderson, Auntie Vie unexpectedly charmed the media and viewers of all ages. By simply being herself-down-to-earth farm gal meets sensational tinsel queen bee, Auntie Vie captured imaginations. Discover the sparkle in Auntie Vie as she shares her story, along with her fashion advice, best recipes, words of wisdom, and thoughts on aging and the power of dance. Frances Barkley was only 18 years old when she became the first European woman to visit the west coast of North America. In 1786, barely a month after her marriage to Captain Charles William Barkley, she had boarded his ship, the Imperial Eagle, and set sail on an adventurous voyage around the world to trade in sea-otter pelts. This sheltered, convent-educated young woman stepped into a new and boisterous world of long and risky ocean passages, foreign ports and exotic peoples—and she loved it.